Sometimes I have to step out of the box of basic reviewing. This came to me all at once as I was waking up this morning after viewing “ANNIHILATION” last night – which by and by I really enjoyed. Sure it started off a bit slow, and I could nit-pick over a few things, but by and far it was a fascinating film – until the ending for me. The last 10 minutes took everything I had previously so enjoyed and threw it out the window. What can I say to that? 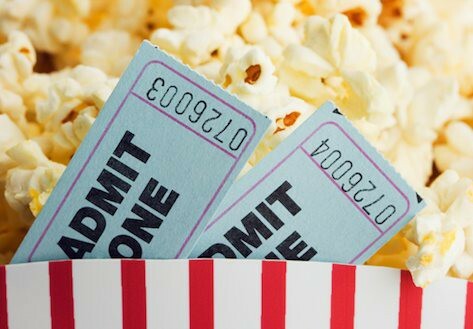 Well I decided to snap it up and make the review like the movie – completely different than the norm. None could figure out what made it shimmer. Save for one, but he can’t recount. So send in the troops , five brave souls and women to boot. the gene cycle seemingly constantly to spurn. Nothing set us up for the finale to come, disappointment was most surely to be done. While beautifully filmed and fairly well acted, there were a few who could be redacted. the ending left me more than feeling a bit blue. Before I forget to mention – I adored the group of women in this film – from the anthropologist Cass (Tuva Novotny), nerdy physicist Josie (Tessa Thompson), to Natalie Portmans’ ex-Army, biologist role of Lena. But my two favourites were defintiely the gung-ho beefy, butched up Gina Rodriguez as Anya, a paramedic who takes her ‘Jane the Virgin’ role and throws it right out the door – to the magnificently almost scary, creepy Jennifer Jason Leigh whose cagey psychologist role of Dr. Ventress takes this performance to a very different level. 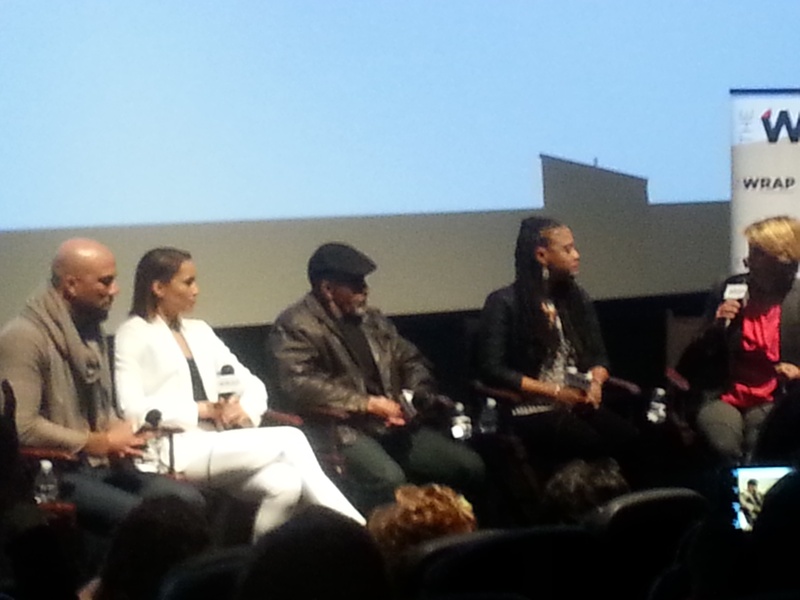 Yes, I should have done this review ages ago as it’s been a month since I attended an Oscar screening of this film along with an after-screening Q & A with Director: Ava DuVernay; Cast members Common, Carmen Ejojo, and Henry G. Sanders. Not even sure why I waited so long, but I will say I’ve thought some about it since then. Maybe it’s because the movie, while I’m not even going to pretend it isn’t a strong, powerful film, just missed a few things for me. And historical inaccuracies aside, as let’s be real, many prestigious movies take dramatic license with historical events and pretty much all bio-pics have them, I think I’ve just been trying to put my finger on what it was. Could be the slower pace of it or the fact that, some needlessly added small odd scenes, at times I thought I was watching a MLK biopic instead of a Selma one, or for me the too strong religious aspect of it. Yes I am fully aware and know MLK was REVEREND Martin Luther King..I am aware of the fact he was a religious man, but since they are taking liberties with some things, including re-writing the “I Have a Dream” speech, this would have been what I would have chosen to tone down some as some of it comes off unnecessary in parts. But whatever it was, I think a lot of it has to do with everything going on from Ferguson to New York to Paris, maybe I’ve been trying to come to terms with man’s atrocities against each other in every way and this film started that for me as it couldn’t have come at a more relevant time. As the opening of the film opens with a heart-wrenching explosion we move along quickly to the man “Dr. Martin Luther King, Jr.” (David Oyelowo), pulling off a performance that seems true to the man without being a caricature or overly reverent. The film acknowledges that King was a man, with faults like any other, but in a way that makes him affecting. Oyelowo doesn’t look especially like King, but he does capture a good rendition of the heart & soul of the man. However, he’s only a piece of the puzzle, with this being a true ensemble film with at least a dozen good roles, from Carmen Ejogo as King’s wife Coretta, to pros like Wendell Pierce as “Rev. Hosea Williams”, musician/actor Common “James Bevel” and Martin Sheen “Frank Minis Johnson” as some of the allies King encountered along the way. The film does a great job portraying just how much the people in the march, from all walks of life, were risking their lives by participating, against a southern resistance ranging from ignorant yokels to devious politicians, to definitely more than a few sadists, who were so keen to inflict harm to the peaceful marchers that at times it’s painful to watch. There are scenes of people riding horses and brandishing whips, covering wood clubs with spoke-like wire to inflict as much damage as possible on the marchers. While some might think it’s puzzling as to where this hate comes from, but even more so in that the film tries to keep an even hand in showing both sides. Tim Roth as “Gov. George Wallace” could have easily played him as demonic, but he tries and somewhat succeeds to humanize him as much as he can, which is not easy when you’re playing one of history’s truly great evil bastards. Tom Wilkinson is very effective as “Lyndon Johnson“, who’s not above playing the good ol’boy card with Wallace, but also sympathizes with King, even if he’s reluctant to stir up trouble and makes a few horrible decisions along the way. In a cast of ‘names’ many of which I have been a fan of for a long long time, yes I’m looking at you Lorraine Toussaint “Amelia Boynton”, Tom Wilkinson, Giovanni Ribisi “Lee White”, Wendall Pierce, Tim Roth and yes, even Oprah Winfry as I wasn’t an ‘talkshow’ Oprah fan, but I am an ‘actress’ Oprah fan. 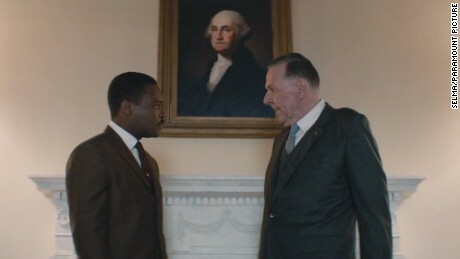 My three standouts of this film that made me sit up and take notice are Stephen James as “John Lewis”, Trai Byers as “James Forman”, and lastly Alessandro Nivola as “John Doar”. 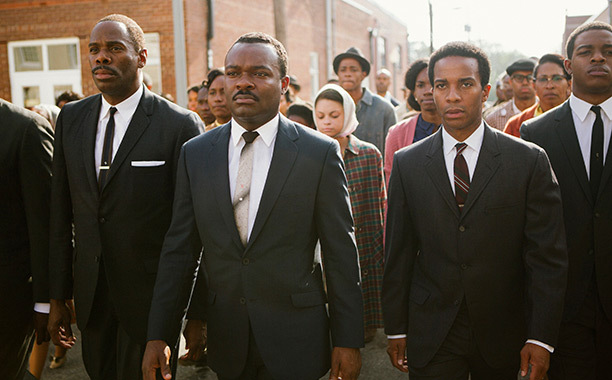 Hopefully the best thing about “Selma” that we can take away from it is that it’s not a movie about blame or hate. Rather, it’s hopeful in that it shows how people can come together and change things for the better in a non-violent manner ~ a message that should always be kept in mind when things get out of hand as they often do. 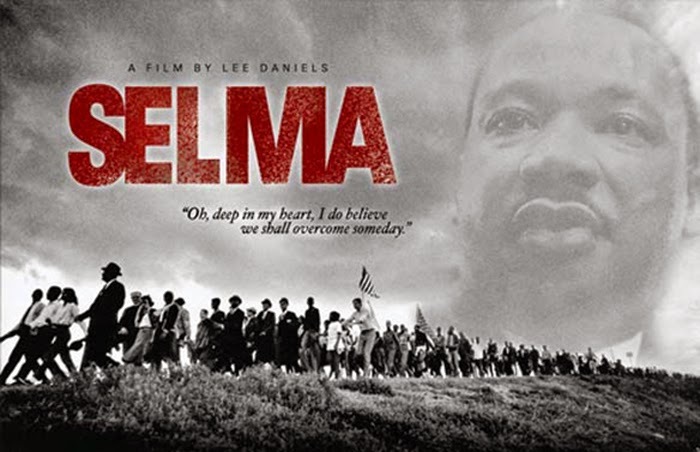 Even with it’s faults,“Selma” is a strong film that sends a clear message to a new generation about what standing up against intimidation in any form is all about. It is a passionate work about a towering figure who left an enduring legacy, but one that, as recent events might indicate, is still short of completion. 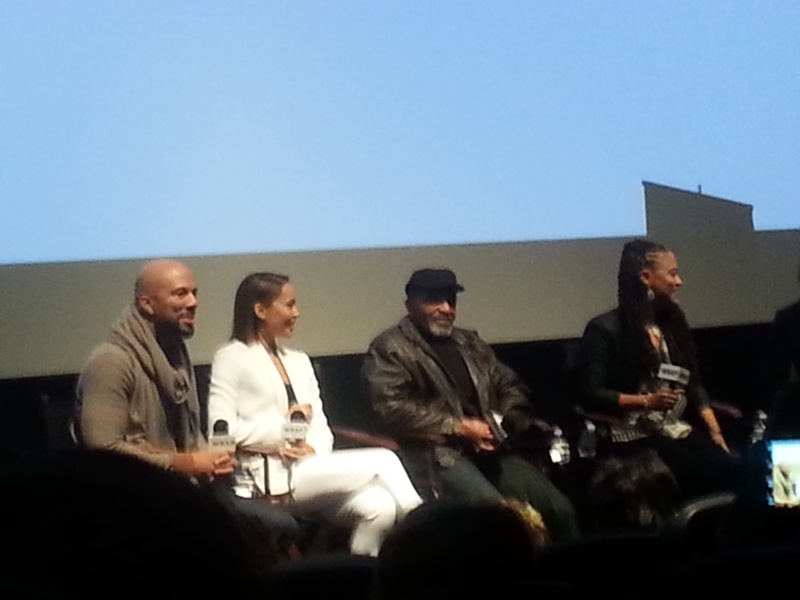 Additional note: I love Q & A’s after films with directors/producers/cast etc. They really give you insight sometimes into things about how the film got made or a fun antidote or two.. This Oscar screening was on Thursday, December 18th,2014 at The Landmark Theater with Dir. Ava DuVernay giving insight into that this project was really made because of David Oyelowo who took it and ran with it (which explains the large Brit casting also! 🙂 ) getting Oprah & her team including Brad Pitt & others involved, including picking her as the director, even though she didn’t have much experience and convincing everyone to get onboard. Also, reasoning behind not using the actual “I Have a Dream” speech..the rights to it are held by someone else who has never used them and they could not get them for this film so she ended up re-writing it herself. As for something I completely did not know, at the end of the film we see a shot of a bridge ~ it’s the “Edmund Pettus Bridge” ~ as DuVernay noted was named after the leader of the Klan back then..it’s name remains today.